A video apparently released by the Islamic State group shows 25 men being shot dead in the ancient city of Palmyra, in Syria. IS said the men were soldiers captured in the city of Homs. They were shot dead inside Palmyra's amphitheatre. IS captured Palmyra and the neighbouring modern city, locally known as Tadmur, in late May. The video was distributed by accounts known to be linked with Islamic State militants. It is not clear when it was filmed. The killings took place on a stage in the amphitheatre in front of a large black IS flag. Several hundred men in civilian clothes are filmed sitting on steps watching the shootings. Among them was a young boy. 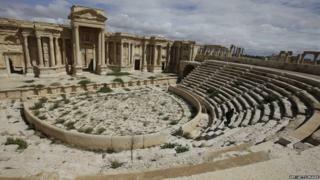 Days after IS claimed Palmyra, it executed 20 men in the same amphitheatre. The UK-based Syrian Observatory for Human Rights says shootings took place in the amphitheatre on 27 May, but it is not clear if those killings are the ones in the video. The video goes on to show the destruction of Tadmur prison, which occurred in late May. In May, Mamoun Abdelkarim, Syria's head of antiquities, said: "Using the Roman theatre to execute people proves that these people are against humanity." Mr Abdulkarim said most of the museum's antiquities had been transferred to Damascus before IS approached the city. Since then, there have been reports that mines have been planted among some of Palmyra's ruins, and there were claims this week that militants destroyed an ancient sculpture outside Palmyra's museum. Since capturing the city, IS has also taken control of a military airbase and a notorious prison nearby. The ancient ruins are situated in a strategically important area on the road between the capital, Damascus, and the contested eastern city of Deir al-Zour. Fighters with IS started claiming vast swathes of Syria and Iraq in 2014, aided in part by the insecurity generated by Syria's civil war. More than 230,000 Syrians have died in the war, which began after President Bashar al-Assad's forces tried to put down anti-government protests in March 2011.